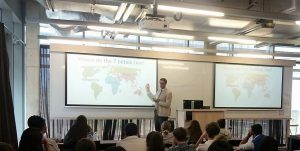 Olof Gränström from Gapminder challenges misconceptions and talks about the need for a fact-based world view at Hult Business school in London. During the talk the students not only had to face their own misconceptions about the world, but they also got a crash course in global facts. The discussions ranged from the need for data to understand the world to a the inevitable fill-up and the demographic momentum. According to Olof, “understanding the demographic momentum is essential to understand the development of the world”!